In that post I explained that my church believes this knowledge is so important, they want all youth to have a taste of what these hardships were like. Learning about the hardships is one thing, experiencing them for yourself is something you will never forget. So, as an organized activity, the teenagers of my church spend a few days recreating the march our pioneer ancestors took on the wagon trains west. Our stake recreates the 'Trek' in less than two weeks! For the first Mormons traveling west, it really wasn't a pleasant experience. They were forced out of the town of Nauvoo, Illinois in February 1846. Can you imaging starting on this journey in the middle of winter? In addition, many of them lost their homes and many belongings in Nauvoo. They did not have time to sell them - mob violence forced them out. Many left without much money or personal possessions. Approximately 3,000 left that winter. Many others were preparing to leave later in the spring. They tried to sell their possessions but could not. No one would buy them knowing they would be abandoned soon and available for free. The Mormons who fled Nauvoo set up a temporary camp across the Mississippi river in Iowa. It was severely cold. For a few days beginning February 24th the temperature was so cold that the river froze. Many were able to cross the river on the ice and join the camp in Iowa. When the winter finally broke, the emigrants started their 300 mile trek across Iowa and then on to Salt Lake. They walked a total of 1,250 miles to reach Salt Lake City. Obviously here in the southeast, in June, we won't have any cold weather. However we will recreate other hardships experienced a few years later on another trek. Some European converts to the church, who wanted to settle in Salt Lake, came to America with very little money. These people had to walk to Salt Lake pulling their belongings in hand carts. No one could afford any team animals to help pull the carts. In addition, the hand carts were not covered as many wagons were. There is one famous hand cart train that experienced extreme hardship on their journey west in 1856. That train was called the Willie Handcart Company and many people on that train did not survive the journey west. Here is a picture of what the handcarts looked like. 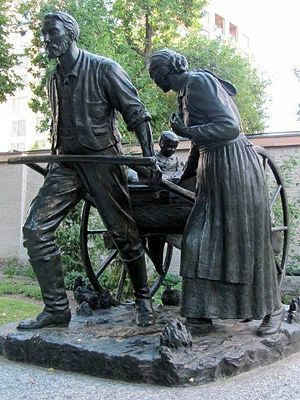 This memorial is on Temple Square in Salt Lake City. My role in in our re-creation of this experience is minor. I am making a quilt for the girls to tie together while they are in the 'city of Nauvoo' gathering their supplies for their journey. (We are making a mock up of the city of Nauvoo as the start point for their journey.) I will be in Nauvoo helping the families gather their supplies. Then, on day three, I will be in one of the 'camp stops' along the trail where the families will stop to eat and rest a bit. Along with other women, I will be making biscuits in the camp for everyone to eat. So, I am responsible for making a quilt for the girls to tie together and a pioneer dress to wear in Nauvoo and at the camp. I have made progress on my quilt! Here is a picture of what I have done so far. The inside squares and the pink border are sewn together. The outside squares are not, they are just lying on the floor in the correct order. I should get them assembled together this weekend. Then I will baste the layers together and it should be ready to go. This quilt will be given to charity after it is finished and the Trek is over. I have not made as much progress on my dress. I did manage to get the fabric cut out. However, that is where it sits. It is a simple pattern so hopefully it won't take too long to put it together. After I make the dress, I will make an apron and bonnet. I expect to have more time next week so everything should come together before the journey starts. I will post another update next week to show you my dress! Take some time to get to know your ancestors. The Church of Jesus Christ of Latter-Day Saints has a FREE web site that you can use to help you locate your ancestors: www.familysearch.org. This web site has all sorts of tutorials and on-line help if you don't know where to start. It has records from all over the world! Anyone, from anywhere in the world with an Internet connection, can access this site to search for their deceased family members. If you want even more help, stop by the family history center at your local church. You do not have to be a church member to use your local family history center. I can't even tell you how happy it makes me to read this post. Not only are you a pioneer in spirit, you are a wonderful woman trying to live a good life. Soooo happy that you've embraced the gospel with all your heart!! Love you!!! I am sorry that I didn't reply to your comment when I posted it. With work, the Trek, and getting the summer garden in, I am swamped! However, I did want to tell you how sweet you are for posting it! I appreciate your friendship and support for my blog!